Blood, sweat, dirt, gasoline and smoke are coming to Energy Solutions Arena in September. The best athletes in skateboarding, motocross, and BMX will be converging on Salt Lake City for the first stop of the 2008 AST Dew Tour. The tour kicked off in Baltimore in June and native Bucky Lasek, who took first in the skateboarding vert event, was stoked to be kicking off the tour in his old stomping grounds. "I can't think of anything else I'd rather be doing anywhere else than in my hometown," Lasek said. "It's a great feeling. Last year I was plagued with a knee injury that I had to get surgery on after the contest, but I still held it together. This year, I already had knee surgery on the same knee because I had a little piece floating in there again that I didn't want to take a chance with. It was couple of months ago, so now I'm back to par and I'm looking forward to it." Lasek has been competing as a pro skateboarder since he was a kid in the early days, when contest purses were minimal and exposure was limited to old school magazines like Thrasher and Transworld Skateboarding. "It's definitely different because when I first started, it would just be a skateboard contest and once it was over, it was over," he said. "Nowadays it's like a full blown activity center. When you're not skating, you can go watch some crazy moto guys or crazy bmx guys doing the most insane things that you would never think you'd see in your lifetime." Now, skating has found a larger, far-reaching audience, but he says his experience has helped him bring it all together. "I pretty much skateboard every day of my life and when it comes time to compete, I think I got it down to an art form to where I can pretty much get in there and know that I'm going to do pretty good," he said. "I just have fun and try not to stress out and skate these contests and test myself and bring home some money at the end of the day." The Toyota Challenge is the fourth of five events on the Dew Tour which will see the world's greatest competitors vying for the largest prize purse in action sports history: $2.5 million, plus a $1 million bonus pool. Now in its fourth year, it is the most watched and attended action sports event and the first tour of its kind. Mike Spinner was last year's 2nd place finalist in the BMX park event and praises the tour's significance. "I would say right now it is the most important contest of the year," Spinner said. "It's a series which means it's not just a one-time deal. I can't even explain it, the ramps are the best, the crowds are the best, the TV production is the best. I have the most fun." Last year was Spinner's first as a pro after coming in as a Wild Card rider in 2006, where he surprised everyone by qualifying 1st in the BMX park prelims. Placing second in the Dew Tour standings his rookie year as a pro was an amazing accomplishment for Spinner, but not nearly as amazing as being the first to land a 1080 in a competition, a trick where he spins his bike three complete rotations in mid-air. This achievement not only earned him the PlayStation Trick of the Week, but also the PlayStation Trick of the Year at the season's conclusion in Orlando. At the series open In Baltimore, Spinner placed third in the BMX park event, behind Daniel Dhers and Ryan Guettier. A humble guy from Florida, Spinner is still in awe of how the Dew Tour has changed his life. "If it wasn't for the Dew Tour and their doing all these little things for the amateurs, I wouldn't be who I am today," he said. "Dave Mirra was my idol since I was a little kid. That's how I got into the whole thing in the first place. I was riding my bike, y'know, just like a little kid, jumping off curbs, and I saw him on the X-Games. This is like ten years ago and I was like 'oh my god, that's awesome, one day I want to do that.' But there was no way in my head that I'd ever become a pro BMXer and now I'm friends with everybody. Dave Mirra sponsors me, I ride for his company, Mirraco Bikes, and I compete against the best guys in the world. I still don't believe it. It's like a dream." 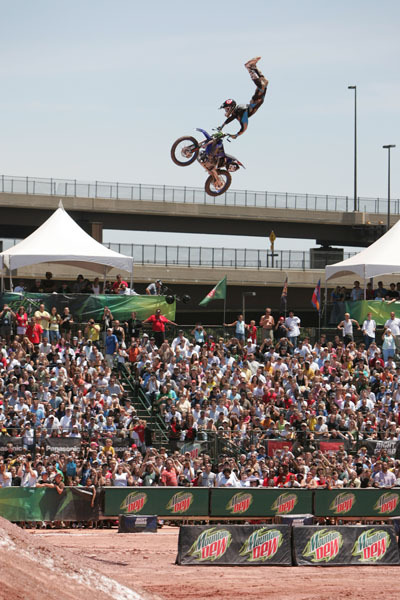 One of the most popular events on the Dew Tour is freestyle motocross, where riders have consistently pushed the bounds of physics, gravity, and sanity. Nate Adams has been riding motorcycles since he was eight-years-old and has dominated the Dew Tour, winning the FMX event the last two years, and finished in 2007 as the series' Athelete of the Year. For Adams, motocross has always been a family affair, having a father who raced flat-track as well as riding with his brother and sister when they were children. Though currently plagued with an injury, Adams says he's going to try and continue his amazing winning streak. "That's the plan," Adams said. "I just come out with my same game plan that I have every year and give it a hundred percent and see what happens. This year it's going to be a little tough. I just had surgery on my thumb, I had a dislocated thumb, so I'm going to be cutting it close being ready for Baltimore. But, I think I can pull it and still get a good finish and maybe just stay consistent at the other two, and hopefully win it for a third year in a row." In Baltimore, Adams placed a close second to Blake Williams in the FMX competition Adams expressed how combining all three styles of action sports into one event is not only great for spectators, but the competitors as well. "We definitely feed off of each other and it's just cool to see all the different disciplines in the same place," he said. "It's just a good series. It has TV time for us, getting us lots of exposure, puts us on the same field as the skaters. With skate, BMX, and moto all together, it has a lot more attention drawn to it instead of one sport on its own." 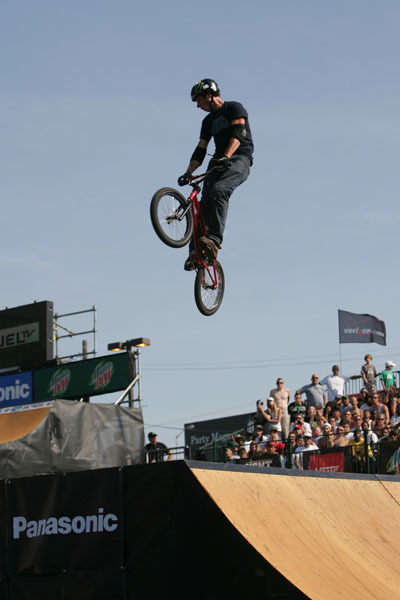 BMX legend Ryan Nyquist competes in both the dirt and park events, winning the first last year and placing third in the latter. He says the Dew Tour is a great event for the younger generation. "I look at that as almost like day care," he joked. "You can just drop your kid off in the village and they can be there for hours just collecting key chains and free stuff. It's just geared to where younger kids can go and have a good time and if they're into a sport they can meet their favorite athletes and get their autographs or just watch them compete." Nyquist had an incredible showing in the first competition, taking first in the BMX dirt event and grabbing a fifth in the BMX park. The AST Dew Tour comes to Salt Lake City after stops in Cleveland and Portland from Sept. 11-14. The series concludes with the finale in Orlando, FL at the PlayStation Pro. Though it will be televised on NBC and USA, Nyquist says you got to see this live. "I don't know anybody that isn't just like completely at one point in awe of what goes on there," he said. "It looks big on TV, but when you're actually there, like with the moto guys, they're like ninety feet in the air just blasting back flips and stuff like that. It's just pretty amazing to see in person. If you haven't seen it, or if you were at the one last year, it's only going to be better this year."